Designed to fit most smartphones and tablets 8" or smaller, the mStand Mobile from Rain Design can hold an iPhone, Android phone, iPad mini, or other compatible phones and tablets at a comfortable viewing angle in either portrait or landscape mode. 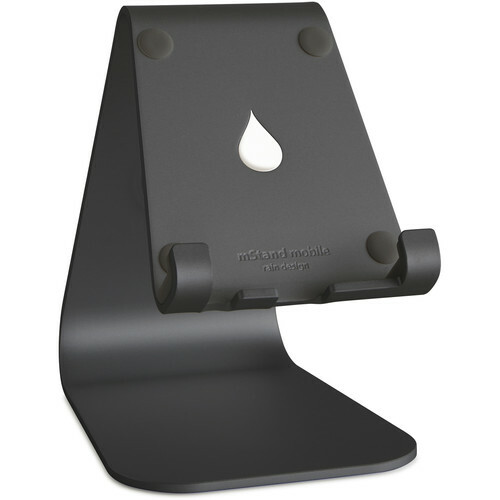 Made of anodized aluminum, the black mStand Mobile features a circular opening in back that helps keep your charging cable out of the way, while the acoustic base channels sound from your device's down-firing speaker. The stand works with the Apple Smart Cover and Case, as well as phone and tablet cases less than 0.47" thick.